It also uses Applescript. Code is provided below (which you'll be able to modify and develop) and you'll need Applescript Editor which you'll find on your Mac. This previous article explained how to send a command to switch to a named preset. As from version 1.4 of LIFXstyle and v1.8.1 of Hue-topia it's also possible to read and set the state of individual bulbs or groups (on/off, hue, brightness, whiteness) from a script. 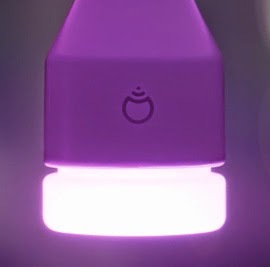 # or tell application "Hue-topia"
You can access a bulb / group by its name or ID. We're using name here (actually called 'title' when scripting). But of course you can easily change this, so to futureproof your script, you might like to use the ID instead (actually called 'identity' when scripting). You can find the identity of a bulb by using the example above. properties of first lamp whose title is "Living A"
Note a lamp must be on when you send hue, whiteness or brightness, otherwise the instruction will have no effect. That's just the way the bulbs work. If you write a cool script, do share. * will pick up the cycle from where it currently is, rather than abruptly starting at red. Wow, you've really run with this, it's great to see. How would I add increments to a current level. After returning the value from the properties command, I can't seem to use the set command with mathematical equation. I also can't seem to set the property to variable. Sorry my apple script knowledge is limited. Thanks. properties of first lamp whose identity is "d073d501ca52"
"Expected class name but found identifier." Hi Tim, I'm not really an Applescript expert but if you'd like to copy your script into an email and send to the support address (support@peacockmedia.co.uk) I'll certainly have a look at it. I was struggling so much to get what I needed, but finally succeeded: A random but subtle and sophisticated way to animate the lights. The usual problem was that I didn't want it to feel like some manic Christmas. Since I found no other examples of this online, I'm sharing it for those who seek for it. That's excellent Riku, thanks for sharing. Works great and I really like it. For LIFX users I'd suggest changing the HueValue parameters to 20 - 35 because above 35 the colour gets a bit green. Glad to know that it works. Kick the brightness zone up a notch and the hue values to greens and a tiny bit of teal, and you've got yourself a sense of trees swaying in the wind. Bring whiteness zone to very low levels, and this works great as party lighting. But you still might not want that full spectrum Christmas feeling. I noticed that you can create multiple brackets, the zone of values used doesn't have to be linear. My only problem now is, how do I stop this? I'd really like to make it into an application, but then there will be no ways to stop it. Any ideas? I have just chatted with David who commented above, and he had a separate applescript to work as a controller that opens an handles the looper script. But there was one bit in the end of his code where I get an error because he wrote it for LIFX and I'm using Hue-Topia, and the particular lingo isn't universal at that specific point. iPhone IP Camera - feeling testy?